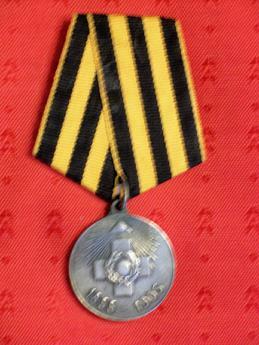 You are looking at a silver medal awarded to all surviving individuals civil or military, male or female, who participated in the defense of Sevastopol, 1854-1855, the battles of the Alma River, Balaklava, Enkerman, Chernoi River and to members of the Fiftieth Anniversary Historical Commission which was detailed to compile the records of the Defense of Sevastopol. The obverse has in the center a cross illuminated by rays of the all seeing eye. On the cross surrounded by oak leaves is the Figure 349 representing the number of days that Sevastopol was besieged. 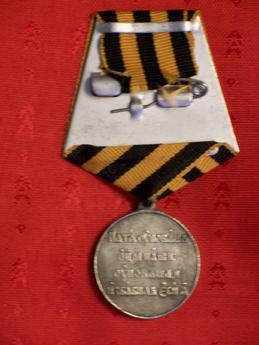 At the bottom of the Medal are the dates, 1855-1905. Reverse has the Inscription, OUR FATHERS TRUSTED IN THEE AND THOU HAS DELIVERED THEM.